It’s that time of year again for many of us – dark when wake up and dark by the time we get home. With shorter days it’s definitely more of a challenge to keep our dogs fit and active, but with a little bit of creativity you can do a lot of fun exercises indoors. Here’s 10 simple & fun indoor games that I love to play when we can’t get outside. They help keep my dog happy, entertained and best of all they prevent boredom. And I have to admit – I think they’re pretty fun as well. Does your dog know how to stay? If so it’ll make this game much easier, if he doesn’t get a human helper to keep him sit still while you hide. This is my dogs favorite indoor game by far, and there’s something so awesome about how simple it is. You can use bits of kibble or your dogs favorite treats for this game. Have him stay while you hide treats around the home. If your dog hasn’t played this game before, start out simple by placing them in plain sight to get them used to the idea. It takes a while for dogs to stop relying so heavily on visual cues and to hone in their excellent sniffing ability. Once your dog has gone a few rounds, you can make it more challenging by hiding treats in some tougher spots. Played correctly tug is a great way for our dogs to get in a lot of meaningful play and exercise. Before you start make sure your dog has a good “drop it” or “leave it” command. If your dog gets extra rowdy or starts mouthing you it’s time to stop the game. And contrary to popular belief you can let your dog win, there’s no evidence that it promotes dominance — in fact studies have shown that letting your dog win just shows that you’re really fun to be around and makes them want to play even more. This is a great starter game for dogs who haven’t practiced nose work before. Simply take a piece of kibble or a dog treat and place it in one of your hands. Hold both of your hands out towards your dog in a fist and have them pick which hand it’s in. 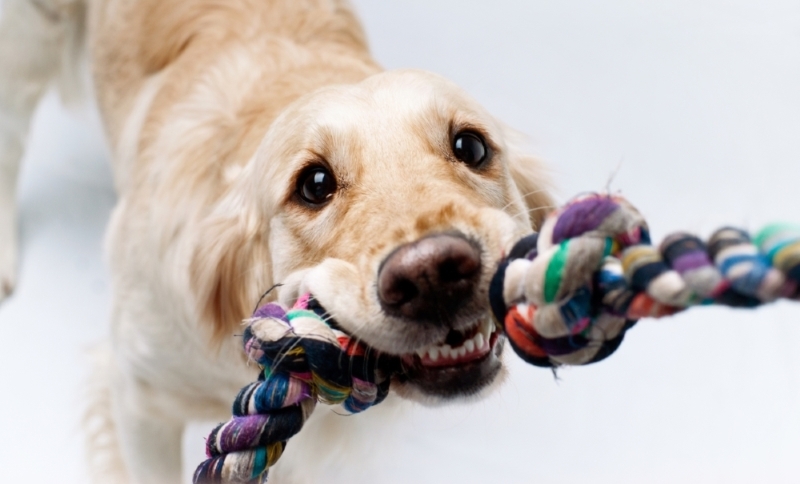 If your dog doesn’t play nicely and mouths you or claws at your hands you can practice some basic impulse control first. One of my favorite “games” ever, and surprisingly my dog loves it, though that might have to do with all the awesome praise she gets once they’re are cleaned up. Start by having your dog pick up a toy near where they’re normally stored. Have your dog “drop it” while standing over the toy box. This might take awhile for your dog to get, I know it certainly did with mine. But with patience and a lot of praise you’ll end up with a dog that can clean up after themselves. Free shaping is building a particular behavior based on small steps. It’s a method of training that allows you to train a new behavior without physical corrections, but by encouraging your dogs natural ability to learn. One of the easiest ways to start with shaping is by using a prop like a box. What I like to start with is having my dog touch the box without me giving any signals. So I’ll set out a box in front of me, grab my clicker and treats and wait for my dog to simply touch the box. Once she touches the box in any way (with her nose or paw) I’ll give her praise. And then you build on that behavior by next having your dog put their foot in the box. According to studies our dogs have roughly the same intelligence as a 2 year old child, with the capability of learning over 200 words. We can put some of those brains to good use by teaching them the names of their toys. Start with one specific toy and start using a name for it; dogs tend to put a ‘value’ on their toys, and by repeating the name while playing with it they’ll start to pick up on the name you’re using. After practicing with a few different toys you can then set them out and have your dog go get their red ball. One of the easiest ways to keep a dog entertained is with a treat dispenser or frozen Kong. There’s a wide variety of treat dispensing toys out there, just make sure to supervise your dog when giving him a new toy. Not many toys are truly indestructible, especially with dogs that love to chew. If your dog is already familiar with treat dispensers you can make it a more of a challenge by freezing the treats inside of the toy first. There are so many interactive dog toys available – there are toys to chase, toys to chew and puzzles to figure out. If your dog likes to chase you can make your own chase toy by attaching a toy to the end of a rope and tying it onto a stick you can wave around for your dog to chase. If you’re going to make a chase toy try using a bungee as the rope so it’ll be easier on your dogs neck when they do catch it. You can also make your own puzzle toy with a muffin tin, some tennis balls and a few treats. Place the treats in the tin & cover them up with the tennis balls and you’ve got yourself a DIY dog puzzle. Another great nose work starter game. Get out 3 cups and line them up in a row in front of your dog. To start put a treat under one of the cups while your dog is watching, give him the OK to show you which one is the right cup. When he chooses correctly praise him & let him have the treat. Once your dog seems to get the hang of it you can make it more challenging by mixing the cups around after you place the treat.